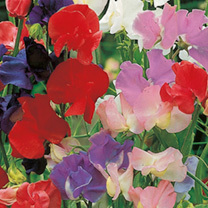 A special blend of the heirloom grandiflora types. Smaller flowered than the Spencers and the modern grandifloras, never the less they have a charm that is all their own and are delightfully fragrant. Height 1.8m (6'). HHA/HA - Half hardy annual/Hardy annual. Scent Key - 2 (Medium scent). Ideal climber. Scented. Attractive to bees. Suitable for cutting. Prefers full sun. Some varieties have hard black seeds and we advise soaking them in water for eight hours before sowing.